Twenty five miles east of Yuma along I-8, Wellton is a small desert town centered a short distance north of the interstate, accessed from exit 30. The flat land further north is irrigated and agricultural, bordered by the Gila River, but to the south stretches the most hostile and least visited desert region in Arizona, most contained within Barry M Goldwater Air Force Range. The infamous El Camino Real has a western terminus just outside Wellton; this rough dirt road crosses the desert for 120 miles, eventually rejoining a paved route at the edge of the Cabeza Prieta National Wildlife Refuge near Ajo. 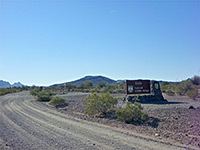 Wellton is also close to Kofa National Wildlife Refuge, the Palm Canyon entrance being 70 miles away along US 95. A gas station and two restaurants are located at the interstate exit, and one hotel; the next chain lodging to the east is in Gila Bend, 87 miles away. The desert town of Wellton in southwest Arizona has just one hotel - the Microtel Inn & Suites - located a little way south of I-8 exit 30, next to the 18 hole Links at Coyote Wash golf course. There are a couple of restaurants nearby and a few more in the town center one mile north, but not much else in the vicinity until Yuma, 25 miles west. The newly constructed three story inn provides clean and comfortable lodging, including some rooms with one or more of a refrigerator, microwave and hot tub bath. The main facilities are free continental breakfast, an outdoor pool/whirlpool, guest laundry and a 40-person meeting room.